Qigong (pronounced as Chee Gung) is also known as Chinese Yoga, or as Neigong (Internal Exercises), which is more like a Chinese version of Pilates. A definition of Qigong is: an internal meditation method using moving and standing exercises practiced to promote the movement of vital energy throughout the body. Qigong increases internal cleansing and healing and has been known to help cure many ailments and improve one's health tremendously. Qigong is a practice that often uses slow graceful movements and controlled breathing techniques to promote the circulation of energy within the human body, and enhance a practitioner's overall health. Qigong's gentle movements, meditation, and breathing techniques cleanse and strengthen the immune system and Life Energy (Qi). The ideas and movements originated thousands of years ago in China. There are also many forms of Qigong that are done with little or no movement at all, in standing, sitting and supine positions; likewise, not all forms of Qigong use breath control techniques. There are more than 10,000 styles of qigong and 200 million people practicing these methods. Another name for Qigong is also Neigong, which means Internal Exercises. 3) To become more connected with the "Tao, God, True Source, Great Spirit", for a more meaningful connection with nature and the universe. Dr . Oz , Oprah's favorite MD, was asked out of all the health practices that one could do, what was the one practice that he would choose and recommend people practice to stay healthy. His response: If you want to be healthy and live to 100, do Qigong. He added that Qigong reverses the aging process. On another Oprah show, Dr . Oz interviewed a couple who had been very overweight with many illnesses. Previously, he started them onto a program of better nutrition and a Qigong practice. They lost much of their excess weight, improved their energy, decreased most medication, and slowed their aging process. These improvements are attributed to Qigong and eating better. "US health care costs stem from an overdependence on high-tech allopathic medicine and pharmaceuticals that treat symptoms; the bureaucracy and paper work of dealing with numerous insurance companies; the threat of malpractice lawsuits; and greed. The current US health care system is set up to make profits for investors rather than to heal… [we] must accept responsibility for our health by making health-promoting choices daily and seeking true preventative care that assists the body's innate healing ability. Therapies other than drugs and surgery need to be available through Medicare and insurance plans… The current system in the US depends upon sickness and high-tech solutions in order to make a profit. Our very economy is dependent upon the health care industry as it now stands. A November 2006 article in BusinessWeekOnline says that '…health care has become the main American job program for the 21st century, replacing, at least for the moment, all the other industries that are vanishing from the landscape.' " Robert J. Zieve, MD in The Townsend Letter (www.townsendletter.com) - February/March 2007. Advanced concepts are explained in everyday language, augmented with practice exercises, and demonstrated through practical applications that can apply to both Qigong health enhancement but also to self defense. This is the ONLY Qigong program available that teaches also the hidden protection aspects of Qigong movements and postures. 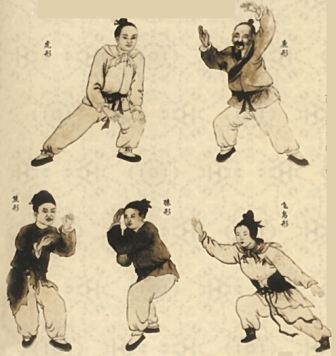 Important material is taught from the original root styles that the internal martial arts were developed from and lays the proper foundation for a deeper understanding of the internal styles of Tai Ji Quan, Xinyi Quan / Xing Yi Quan, and Ba Gua Zhang. The material is very efficient and effective for learning practical self-defense and furthering one's current knowledge and training in the various internal martial arts. Without this true learning of the most ancient methods and body mechanics, one can attempt to practice internal martial arts for many decades but will never be able to generate any internal energy for healing and self defense. Most importantly, instruction will be given in HOW to feel the movements by using the deeper muscles, correct body mechanics, correct body alignment, and correct rooting. Information is also given on WHY movements are done so. Over 30 years of research and experience has been done to develop the course materials for this program! Foundational sitting, standing, stretching, conditioning, and strengthening movements that prepare one for the later lessons. The focus is on opening both your body and mind. On the physical side, works on flexibility, range of motion, and easy movements to open and lengthen all parts of your body. Movements also stimulate all the major energy systems in your body. To open your mind, we'll teach you an effective stress-relief and relaxation technique, plus a simple Qi energy awareness practice. A. Active Qigong - To open the body, we use primarily movements in the limbs to open up the spine, hips and legs, and arms and shoulders. As an introduction to Qigong, some simple and easy to learn standing and moving movements are taught in a series of eight postures. Aids in aligning, stretching, conditioning, balancing, and strengthening the body. This exercise is very ancient and is both Taoist and Buddhist influenced. B. Passive Qigong - seated or standing activates hands and feet points. Various Qigong methods are taught, some simple and easy to learn standing and moving movements. Aids in connecting the mind with the body. These exercises are very ancient and are both Taoist and Buddhist influenced. 1. Falling Water Qigong – To open the mind, focuses on draining stagnant Qi from the hands and feet. C. Qi Emission - focuses on generating and feeling Qi in the palms. 1. Following Qigong – sensitivity & awareness training. Single arm and double arm methods. The focus is on physical coordination that will teach you how to use your body in an integrated fashion and on coordinating movement, breathing, and mental concentration to increase the benefits you get from Qigong. 1. Constant Bear Qigong – This exercise works the waist, hips, and legs using a combination of turning and weight shifting. 2. Reverse Bear Qigong – This exercise adds in ‘silk reeling' (staying connected as weight transfers from one side to other). 3. Embrace the Pearl Qigong – Standing exercise done without movement in order to focus concentration with breathing. Accumulates and restores energy in body. 4. Lifting Water Qigong - tool for learning relaxed arm movement using deeper muscles without tension. 5. Spiraling Qigong - increases mobility, flexibility, and coordination of arms and torso, while relieving muscular tension. Rooting is the single most basic concept in all of neigong and internal martial arts. Rooting involves keeping both a physical and an energetic connection to the ground for stability, balance, and centering. Also, focus on ‘Tai Ji Energetics', giving you the experiences of working with Qi both inside and outside of the body. 1. Isolated Spine Stretch - develops awareness of the upper body structures, primarily the spine. 2. Waterpump Qigong - develops awareness of the lower body structures, the hips and legs. 3. Three Circle Qigong – standing neigong for rooting and and actively circulating Qi throughout the body. 4. Universal Post Qigong – neigong for physically and energetically developing rooting in legs and feet, while being single weighted in Cat Stance. 5. Circling Hands Qigong – various advanced exercises for rooting the lower body while in Bow Stance and spiraling the upper body circulating Qi (Cloud Hands, Wave Hands Like Clouds, Flower Hidden in Mirror, etc.). Level 4: Four Energies Neigong and Centering Elements Qigong - integrates the whole mind-body with flowing standing and walking movements. Centering Qigong connects to the energy fields of the Five Elements and energizes and harmonizes these areas for physical, mental, and spiritual health.  Rub hands – stimulate ‘laogong' (human gate) energy points in palm centers.  Energize temples – press warm palms to temples.  Tap the head – tap fingers gently over skull and temple areas.  Tap the central body – tap fists from breastbone to abdomen.  Tap legs and arms – taps fists over lower back and over front and back of legs and arms.  Develop Qi attentiveness – slowly raise & lower each arm with attention to laogong points.  Stand on Tightrope – develop balance & concentration, arms out, arms in, and arms crossed. - and begin to correctly use Shaolin body mechanics that bridge to Tai Ji Quan (swing, sink, and point). Subdue Dragon & Tiger Palm -- Jiang Long Zhang (kidneys). - self defense version of the exercise set exists as well. 7. Forcibly Pull Nine Bulls -- Li La Jiu Niu (8x). - emphasize the correct way to use the internal concepts of Yielding, Sinking, Absorbing, Transferring, and Pointing energy for both health and self defense. - are vigorous and feature special stepping patterns that are a bridge to Tai Ji Quan and Xing Yi stepping methods. - are made to enhance emotional health, vitality, muscle tone, internal strength, and internal cleansing of the bowels. - are a link to ancient Taoist methods also known as the Tai Ji 13 Gung, and Buddhist yogic movements originally from India. - also a powerful self defense set containing all these movements and some additional transitional movements that feature the full 18 Luohans. Old Monk Carries Basket on Arm. After learning and MASTERING all 3 Rou Gong sets, the student will be able to have the CORRECT body mechanics and internal energy development and movement necessary to truly understand and perform the most ancient and traditional methods of the Shaolin system and support a strong foundation for mastering the other internal arts of Tai Ji Quan, Xing Yi, and Ba Gua Zhang. Special Shaolin neigong set that is similar to elements of Indian Yoga and Taoist Daoyin exercises. Special set for medicinal healing. Level Nine - To be announced.